Spoiler Free Review: This book is awesome. First off, main characters are male *and* female. Not in the way of the male leads are off being badasses while the females are being the social butterflies or being the voice of reason. Each character has their own way of being able to handle themselves in bad situations, each progress the story, and the males seem to be the main eye candy. This needs to happen more often, as it is remarkably refreshing and I am now seeking other books with this dynamic. There are four main characters, Blaise, Augusta, Gala and Barson. The shifts between characters are nicely done, and similar to the Unwind series.Initially this bothered me as normally I feel this is a cop out for the authors. However in this book it is necessary, as there is just so much going on with interpersonal relationships and the world politics of not just there being a ruling class but also *why* it is the ruling class. Again, the shifts in perspective are well done. To the people who enjoy world building: It is grand in this book. It is subtle and *consistent*. Five stars for this, and I hope to read the next installment soon. The best thing I like about this story is how Blaise wants to make magic more available for the common people and break the barrier between common people and sorcerers. Also the flow of story pulls you in and keeps you interested.I truly enjoyed Reading to this book which captures the imagination of the reader throughout. The book follows the perspectives of four different characters (being as Blaise, Gala, Augusta and Barson) which make the audience understand the importance of the relationships between the characters.To all true book readers and people that like to get lost in the book, this is a book that should be include in your library of books. Once again, I am thoroughly impressed with the writing of Dima Zales and Anna Zaires. 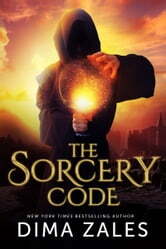 The Sorcery Code had me hooked from the beginning to the end. The best part is how the rest of the story is set up in the beginning. I also like how Gala explores everything that's going on. All through the book, I couldn't wait to find out what would happen next. The narrator, Emily Durante, made the book exciting to listen to. She did an excellent job at distinguishing the different characters, and different emotions. She doesn't have a monotone voice like many narrators do, and she kept a good pace. I would recommend this to anyone who enjoys fantasy. I can't wait for part two! I like their twisted love stories, their powers and characters. The story will bring you to the magical realm of your thoughts. the story alone is the best! Emily Durante give out the emotions in the book. Was there a moment in the book that particularly moved you? yes, like how Gala turned up to be pulled unto Blaise. How she can be like a superhuman that's so beautiful, innocent and intelligent. Their first part of the book, especially their first meeting that was rather cool! Any additional comments? i want the volume 2 now! Engaging and full of intrigue. Set in world divided between the sorcerers and commoners, it is the story of a kind hearted and intelligent sorcerer Blaise who wants to help the people of his realm. In his pursuit he creates Gala, a beautiful and enigmatic being, who may look human but has the, yet unexplored, ability to tap into the magical realm better than any sorcerer or sorceress of the day. She is the key to the salvation of countless people, if only she could comprehend the full extent of her powers. As a reader/listener I really enjoyed experiencing the world through Gala’s eyes, for whom every moment is a fresh opportunity to learn something new and enjoy the beauty of the physical realm. Gala is an amazing character who can empathize with both people and animals. . All Set in world divided between the sorcerers and commoners, it is the story of a kind hearted and intelligent sorcerer Blaise who characters are well thought of and all have their own motives, fears and aspirations that drive their actions. With every page that I read, the story became more and more complex until I was left glued to my seat with a barely controlled curiosity to know what happened next. I like the fact that the story does not rely too much on the romance between Blaise and Gala to keep the readers engaged. The chapters told from the point of view of Augusta and Barson are a fresh change. I do feel that the author could have made the fantasy aspect of the story more interesting and more vivid.